صالحی صدقیانی, جمشید, شمس, سیده هدی, مخصوصی, علی. (1394). مدیریت استعداد؛ مفاهیم و مدل‌ها. مطالعات منابع انسانی, 5(18), 121-138. جمشید صالحی صدقیانی; سیده هدی شمس; علی مخصوصی. "مدیریت استعداد؛ مفاهیم و مدل‌ها". مطالعات منابع انسانی, 5, 18, 1394, 121-138. صالحی صدقیانی, جمشید, شمس, سیده هدی, مخصوصی, علی. (1394). 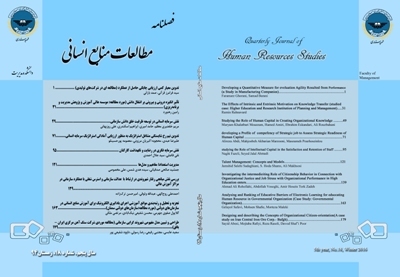 'مدیریت استعداد؛ مفاهیم و مدل‌ها', مطالعات منابع انسانی, 5(18), pp. 121-138. صالحی صدقیانی, جمشید, شمس, سیده هدی, مخصوصی, علی. مدیریت استعداد؛ مفاهیم و مدل‌ها. مطالعات منابع انسانی, 1394; 5(18): 121-138. 1استاد دانشگاه علامه طباطبایی. تهران، ایران. 2دانشجوی دکتری مدیریت دولتی، گرایش تصمیم گیری و خط مشی گذاری، دانشگاه تهران –فارابی قم. 3کارشناس ارشد مدیریت دولتی، گرایش منابع انسانی، دانشگاه آزاد اسلامی، واحد تهران شمال. تهران، ایران. امروزه منابع مالی و فنی تنها مزیت سازمان‌ها به‌شمار نمی‌روند. در اختیار داشتن افرادی مستعد و توانمند علاوه بر ایجاد مزیت رقابتی در سازمان می‌تواند فقدان و یا نقص دیگر منابع را نیز جبران نماید. در سال‌های اخیر متفکران مدیریت از مفهومی به نام مدیریت استعداد سخن گفته‌اند و طی چند دهه گذشته سازمان‌ها از برنامه‌های مدیریت استعداد و تربیت جانشین برای یافتن نسل جدید رهبران استفاده کرده‌اند. این مقاله با رویکردی کتابخانه‌ای و استفاده از مقالات و ادبیات مرتبط تلاش می‌نماید تعاریف و مدل‌های متنوع مدیریت استعداد را از جنبه‌های گوناگون مورد تحلیل و بررسی قرار داده و در نهایت با مقایسه آنها، مدل مفهومی جامعی را برای مدیریت استعداد در سازمان ارائه دهد. Dries, Nicky. (2013). The psychology of talent management: A review and research agenda. Human Resource Management Review, 23, 272-285. Erdem Aksakal, Metin Dağdeviren, Ergün Eraslanb, İhsan Yüksel. (2013). Personel Selection Based on Talent Management. Procedia - Social and Behavioral Sciences, 73, 68 – 72. Erdem Aksakala, M. D. (2013). Personel Selection Based on Talent Management. Procedia - Social and Behavioral Sciences, 73, 68 – 72. Gandz, Jeffrey. (2006). Talent Development : The Architecture of a Talent pipeline That Work. Ibraiz Tarique, Randall S. Schuler. (2010). Global talent management: Literature review, integrative framework, and; research, suggestions for further. Journal of World Business, 45, 122–133. Lewis, R. , & Heckman, R. (2006). Talent management: A critical review. Human Resource Management Review, 16, 139-154. Marian Thunnissen, Paul Boselie, Ben Fruytier. (2013). Talent management and the relevance of context:Towards a pluralistic approach. Human Resource Management Review, 23, 326–336. Marie¨ lle Sonnenberg, Vera van Zijderveld , Martijn Brinks. (2014). The role of talent-perception incongruence in effective talent management. Journal of World Business, 49, 272-280. Mehmet Altinöz, Demet Çakiroğlu,serdar. (2013). Effects of talent management on organizational trust: a field study. Procedia - Social and Behavioral Sciences, 99, 843 – 851. Mellahi, David G. Collings Kamel. (2009). Strategic talent management: A review and research agenda. (melahi, Ed. ) Human Resource Management Review, 19, 304–313. Michaels, E. , Handfield-Jones, H. , & Beth, A. (2001). In The war for talent. McKinsey & Company. Harvard Business School Press. Paul Iles, Xin Chuai , David Preece. (2010). Talent Management and HRM in Multinational companies in Beijing: Definitions differences and drivers. Journal of World Business, 45, 179–189. Roper, Deborah R. Phillips and Kathy O. (2009). A framework for talent management in real estate. Journal of Corporate Real Estate, 11, 7-16. Schiemann, William A. (2014). From talent management to talent optimization. Journal of World Business, 49, 281–288. Schweyer, A. (n. d. ). Talent management systems: Best practices in technology solutions for recruitment, retention and workforce planning. New Jersey: John Wiley & Sons. Sweem, Susan L. (2009). Leveraging Employee Engagement through a Talent Management Strategy: Optimizing Human Capital through Human Resources and Organization Development Strategy in a Field Study, dissertation. Walter G. Tymon Jr. , S. A. (2010). Exploring talent management in India: The neglected role of intrinsic rewards. Journal of World Business, 45, 109–121. Williams, M. (n. d. ). The war for talent: Getting the best from the best. London:CIPD. Yalçın Vural,Pelin Vardarlier,Abdullah Aykir. (2012). The Effects of Using Talent Management With Performance Evaluation System Over Employee Commitment. Procedia - Social and Behavioral Sciences , 58, 340 – 349. Yapp, Maria. (2009). Measuring the ROI of talent management. Strategic HR Review, 8, 5-10.